Buy Tamil books - Tamilcube bookshop, Singapore. All these Tamil books are based on the latest Singapore MOE syllabus authored by local teachers. They are available to you as eBooks (PDF) and printed books. Friday : 9:30 am to 8:30 pm. Friday : 5:30 pm to 8:30 pm. 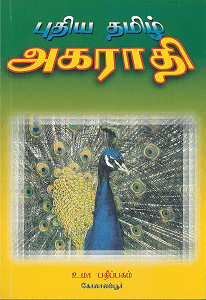 Now, you can order the Tamil books from Tamilcube bookshop instantly online. We provide free shipping within Singapore through Singpost. For overses orders, shipping charges aply. Teachers, schools and learning centres who would like to place bulk orders are welcome to contact us. We ship our Tamil books worldwide! Please note that the prices indicated on this page are in Singapore Dollars that excludes shipping charges. Once we receive your order, we will advise you on the shipping charges. Please note that custom duties may be applicable on your order when it arrives in your country. You may refer to Singpost's website for International Shipping Charges. Suitable for Nursery and K1 children. An attractive Tamil Activity book for Nursery level. In about 100 pages, this book offers plenty of coloring, matching and more activities. This is a must for each child for learning Tamil alphabets and basic Tamil vocabulary. Based on the MOE syllabus. Suitable for K1 and K2 children. A set with three books: Textbook, Writing practice book, Assessment book. Based on the latest MOE syllabus. Suitable for Nursery, K1 and K2 children. A set with three books: Textbook, Writing practice book, Assessment book. Based on the latest MOE syllabus. Buy Tamil educational toys and games: Now you can buy Tamil educational toys and Tamil learning games from Tamilcube online. A very useful collection of Tamil testpapers and topical based Tamil worksheets suitable for Primary 1. 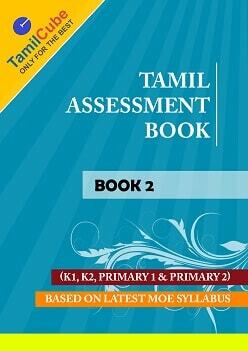 A very useful collection of Tamil testpapers and topical based Tamil worksheets suitable for Primary 2. A set with three books: Textbook, Writing practice book, P1 Assessment book. Based on the latest MOE syllabus. A set with three books: Textbook, Writing practice book, P2 Assessment book. Based on the latest MOE syllabus. A very useful collection of Tamil testpapers and topical based Tamil worksheets suitable for Primary 3. A very useful collection of Tamil testpapers and topical based Tamil worksheets suitable for Primary 4. 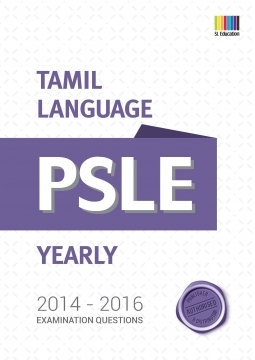 PSLE Tamil past 3 years exam questions with detailed answers. The answers are provided by experienced teachers from Tamilcube. Suitable for Primary 5 and Primary 6 students for PSLE preparation. PSLE Higher Tamil past 3 years exam questions with detailed answers. The answers are provided by experienced teachers from Tamilcube. 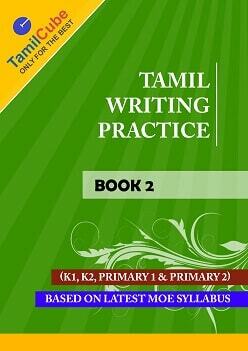 Suitable for Primary 5 and Primary 6 Higher Tamil students for PSLE preparation. A very useful collection of Tamil compositions suitable for normal Tamil and higher Tamil for upper primary level. View sample content from this book on Tamilcube Academy. Revised Edition based on the latest MOE syllabus (2016 / 2017). 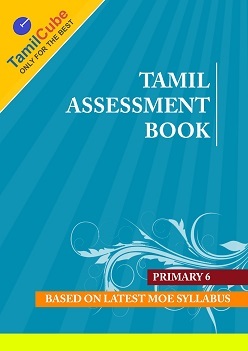 This book contains useful collection of Tamil testpapers and topical based Tamil worksheets suitable for normal Tamil and higher Tamil for P5. A very useful collection of Tamil test papers and topical based Tamil worksheets suitable for normal Tamil and higher Tamil for P5, P6 and PSLE. A very useful collection of Higher Tamil test papers and topical based Tamil worksheets suitable for Primary 5, Primary 6 and PSLE. Revised Edition based on the latest MOE syllabus (2016 / 2017). 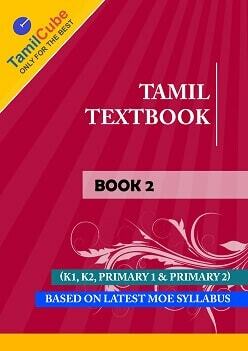 This book contains several Tamil oral practice pictures and videos with sample answers in text as well in audio format. Sample Tamil reading passages in text and audio are also provided. Also includes Tamil listening comprehension practice with audio instructions. Suitable for normal Tamil and higher Tamil for P5, P6 and PSLE. Revised Editions based on the latest MOE syllabus (2016 / 2017). 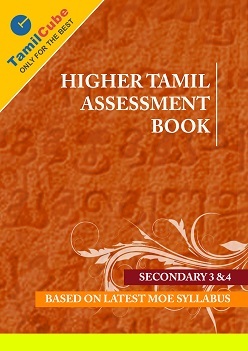 Buy all the above three P5 Tamil books (Tamil assessment book, Tamil composition guide and Tamil oral exam guide) and save! For excelling in P5 exams, these are the only three books you will ever need! Revised Editions based on the latest MOE syllabus (2016 / 2017). Buy all the above four P5 Tamil books (Primary 5 Tamil assessment book, Tamil composition guide, Tamil oral exam guide and Higher Tamil assessment book) and save! For excelling in P5 exams, these are the only four books you will ever need! Buy all the above three PSLE Tamil books (Tamil assessment book, Tamil composition guide and Tamil oral exam guide) and save! To ace the PSLE Tamil exam, these are the only three books you will ever need! Revised Editions based on the latest MOE syllabus (2016 / 2017). Buy all the above four P6 Tamil books (Primary 6 Tamil assessment book, Tamil composition guide, Tamil oral exam guide and Higher Tamil assessment book) and save! For excelling in P6 Tamil exams and PSLE Tamil, these are the only four books you will ever need! A very useful collection of Tamil compositions suitable for normal Tamil and higher Tamil for upper secondary level. It also comes with several useful phrases with meaning and examples including மரபுத்தொடர்கள், உவமைத்தொடர்கள், இணைமொழிகள், பழமொழிகள், இனிய தொடர்கள், Tamil vocabulary list and more. A very useful collection of Tamil test papers and topical based Tamil worksheets suitable for normal Tamil and higher Tamil for Upper Secondary level (Secondary 3 & 4). A very useful collection of Tamil test papers and topical based Tamil worksheets suitable for Higher Tamil for Upper Secondary level (Secondary 3 & 4). A very useful collection of Tamil test papers and topical based Tamil worksheets suitable for normal Tamil and higher Tamil for Lower Secondary level (Secondary 1 & 2). 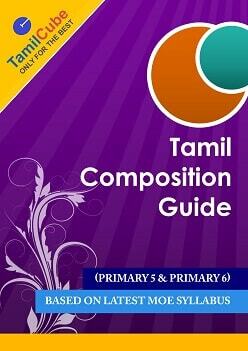 Buy the two Tamil books (Secondary 1 & 2 Tamil assessment book and Tamil composition guide) and save! To ace the Secondary 1 & 2 Tamil exams, these are the only two books you will ever need! Buy the two Tamil books (O-Level Tamil assessment book and Tamil composition guide) and save! To ace the O-Level Tamil exams, these are the only two books you will ever need! MOE approved Tamil-Tamil dictionary. A must have Tamil dictionary for school students preparing for PSLE, O-Level and A-Level Tamil. 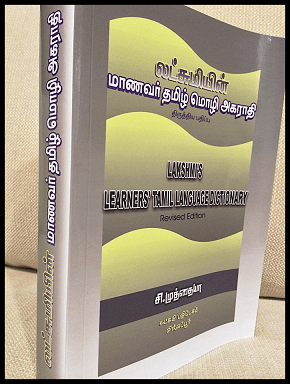 This dictionary is suitable for both Normal Tamil and Higher Tamil preparation. The entries in this dictionary have been carefully chosen from the textbooks used in Singapore and India, Tamil Murasu and selected children's literature of famous authors. This dictionary of over 600 pages, contains more than 700 entries with suitable example sentences. Click "Buy from Tamilcube Shop" button in this page for the book you want to purchase. You will be directed to Tamilcube Shop which enables you to make payment through PayPal. You will be able to download the Ebooks immediately after making the payment. How to order Tamil books? Place order online now: Click "Buy from Tamilcube Shop" button in this page for the book you want to purchase. You will be directed to Tamilcube Shop which enables you to make payment through PayPal. Call us now : 66186567 | SMS / Whatsapp / Call 98501472. In addition to Paypal payment, you can also make payment by ATM transfer or online bank transfer. If you prefer to pay cash on delivery, please talk to us. How the books are delivered? Home delivery : Within 1 to 5 working days upon receiving your order and verifying your payment, we will mail the printed books to your address through Singpost. Usually, Singpost delivers the books to your mail box within 1 to 5 working days. National Library Board : A lot of printed and digital Tamil books available for borrowing. Dictionaries : List of MOE approved Tamil dictionaries.